Full wedding/event coordination & planning services. Fine Tableware & eclectic rentals for weddings and events (farmhouse tables and benches, antique china, flatware, beautiful glassware, etc.). Please visit our website for full list of services and Julian wedding venues. 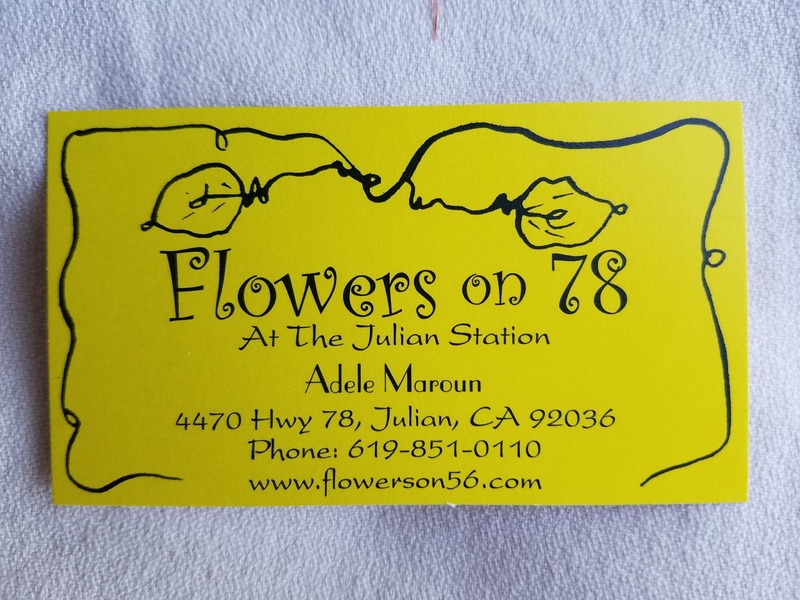 After a few years of traveling and brief residencies in Africa, Europe and the United States, Adele found herself drawn to the San Diego area and settled there permanently in 1989, where she started her business “Flowers on 56.” She quickly established herself as a creative floral designer and was soon sought after to do the flower arrangements for a number of hotels, businesses, community and private events, especially weddings. Testimonials about her work highlight her creativity, uniqueness, originality, and artistry. In 2016 Adele had the opportunity to move to Julian, CA to design in a more rural and peaceful setting, that also happens to be a popular destination for weddings. 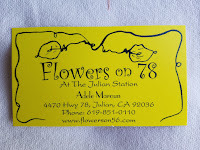 She changed her business name to “Flowers on 78” and is establishing herself as Julian’s wedding florist. Flowers on 78 caters to any bride from the basic wedding to the luxurious, doing it all from the bridal bouquet to the wedding cake. We offer rentals of all containers, arches, etc. We will be there to make your day a memorable one.